All Soul’s Day is fast approaching. The family and friends of renowned scientist Leonard Co will visit his ashes yet again with a heavy heart as no justice has been served 8 years after he was killed. Leonard Co was a highly esteemed ethnobotanist, conservation biologist, ethnopharmacologist, and teacher. Having joined and worked with an activist group during his early college years in the University of the Philippines and former dictator Marcos’ Martial Law, Co’s interest in science and botany turned into a lifelong dedication to using his knowledge, skills, and discipline to truly serve the Filipino people. He founded organizations such as the Philippine Native Plants Conservation Society, Inc. (PNPCSI). The establishment of PNPCSI was out of the commitment to the idea that the nation’s botanical resources should be, first and foremost, of service to the Filipino and their respective natural habitats should be well-preserved and taken care of. Along with fellow academics and advocates, he also founded Baguio-based NGO Community Health, Education, Services, and Training in the Cordillera Region (Chestcore). Having been immersed in the grassroots communities for decades, he devoted most of his life’s work to documenting and systematizing communities’ medicinal practices, paving the way for their development. The list of his contributions to the fields of science and health as well as the people’s struggle goes on. Survivors of Co’s group and the independent fact-finding mission conducted shortly after the incident testified to the fallacy of this claim and showed that there was, in fact, no indication of any crossfire. These parties had also urged the government to investigate the case further and ensure accountability. It was January 2011 when the Department of Justice (DOJ) and the National Bureau of Investigations (NBI) conducted its own fact-finding mission and released its report which immediately cleared the Army of the killings. Co’s family, along with supporters, protested said report and filed criminal charges of murder against the 19th IB themselves. While no conclusive reports by CHR and DOJ have been released yet, the latter had downgraded the case filed by the Co family from that of murder to reckless imprudence resulting in homicide. The arraignment of the case will take place on the 14th of November 2018, on the eve of the 8-year mark of Co’s death. 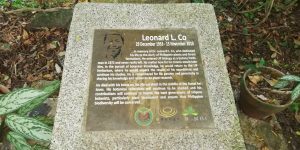 This November 15, we commemorate selfless scientist Leonard Co’s death and continue to seek accountability from the 19th IB for the evident attacks on the four-man team in Leyte. We hold the military accountable for the murder of Co and his companions. Not only is the reduction of the case a clear testimony to the thriving climate of impunity enabled by the current regime and its almost identical predecessors, but it is also a gross, disrespectful offense to Co’s family and all families who only wish to seek justice for their fallen beloved. We urge DOJ to raise the case to murder and ascertain that the Army members responsible for the malicious attacks to be convicted as they should. Lastly, we call on all supporters of Leonard Co and the scientific community to be one in the struggle for true justice as the case’s arraignment nears. Let us be one in the rallying cry against impunity and demand justice from all those accountable.